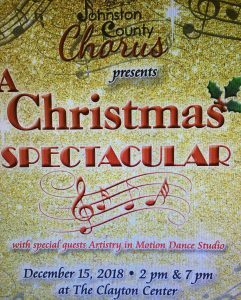 Join us as The Johnston County Chorus presents “A Christmas Spectacular” along with special guests Artistry in Motion Dance Studio. This annual Christmas favorite is filled with pop and secular Christmas music the whole family will enjoy! The show will also include a joyous filled sacred half as we celebrate the Reason for the Season. Saturday, December 15 (2 shows) 3:00pm and 7:00pm. Tickets available NOW online at theclaytoncenter.com or by calling the box office at 919-553-1737. Ticket prices: Adults $16 • 12 and under $12 ( plus sales tax and fees). Discounts for groups of 8 or more. Hand-crafted items for everyone on your list. All aboard! 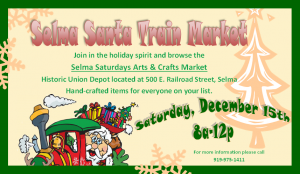 Join us for an unforgettable seasonal journey on the Selma Santa Train. 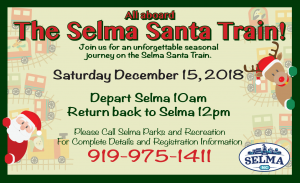 Young and old will be whisked off to enjoy the round trip ride with Santa on board. Does Santa really like juice and cookies? You’ll find out as they are served while on the train. Families are encourage to wear their pajamas and be ready to join in on the caroling and sing-along while on board. This event is open to all. It’s online and you may win prizes and/or the BIG prize of Mystery Hostess!! Everything at this event it $1 to $5. Online/24/7 until Jan. 10th. A non-competitive, step-by-step drawing method for children and adults where self-expression and creativity can flourish. Local Artist, Linda Stevens, has volunteered to teach painting at the Benson Center for Active Aging beginning in Jan 2019. 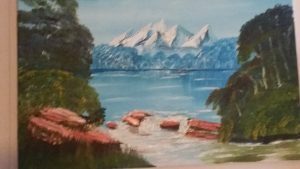 Linda is an Oil Painter and artist from the Benson area and is excited about teaching others to paint and enjoy the art they see each and every day. Please contact the Center to get your name on the list for the classes. We will begin classes in January 2019. Come join in!